Over the last couple of years we have had a number of discussions about the mechanics of stability and capsize risks. Recently these issues have come up again, and we thought this might be a good time to revisit this fundamental safety issue. In the ensuing blog we are going to show you some rather unpleasant photos and video. These are worth watching as they will give you a feel for the real world risks involved, albeit small, in this watery world for which we all share a love. We’ll discuss stability, its impact on comfort, and what enhances or degrades it. We will also go into some detail on the process used to evaluate stability in the design phase. Our goal is to convince you that heavy weather risks, while remote, should be taken seriously. And that sailors and powerboaters should be realistic in assessing the capabilities of crew and vessel. Let’s start with a short video of a commercial trawler in a strong gale. There are several things to note about this event. The two vessles are running with the seas, but the breaking crest which capsizes the lead trawler is from the beam. This is often referred to as a “sneaker” wave. However, waves coming from a different direction than the norm are not at all unusual, and if there has been a frontal passage you will get a 90-degree wind shift with its accompanying new sea direction. We don’t know the stability figures for this vessel in its present trim. However, we can assume that it met the minimum stability levels required by authorities, which are typically much more rigorous than for pleasure craft. This photo is from the 1979 Fastnet Race in which 23 yachts were abandoned and numerous crew lost their lives. It is of an RNLI lifeboat out on a rescue mission after the seas had substantially flattened.You can download the post race inquiry here. Aside from a tragedy, this race was a seminal event in yacht design, and gave rise to a variety of research on capsize mechanisms. Author (and good friend) John Rousmaniere was in the race and wrote an interesting piece on the 20 year anniversary which you can read here. Forward now to the 1998 Sidney Hobart Race. This is a tough part of the world to cruise, worse yet if you are scheduled to race with no precedent for postponing due to weather which is almost always bad at some point in the race, with 98 being especially awful. Like the 79 Fastnet the 98 Sydney Hobart was a yacht design and storm tactics crucible. Our own direct experience? Limited. A brief 65/80 knot blow off Cedros Island in Mexico, three days of strong gale to storm force winds off the coast of South Africa, and eighteen hours in a 65 knot (gusting higher) northeaster near Cape Hatteras (the photo above was taken after things had calmed down). 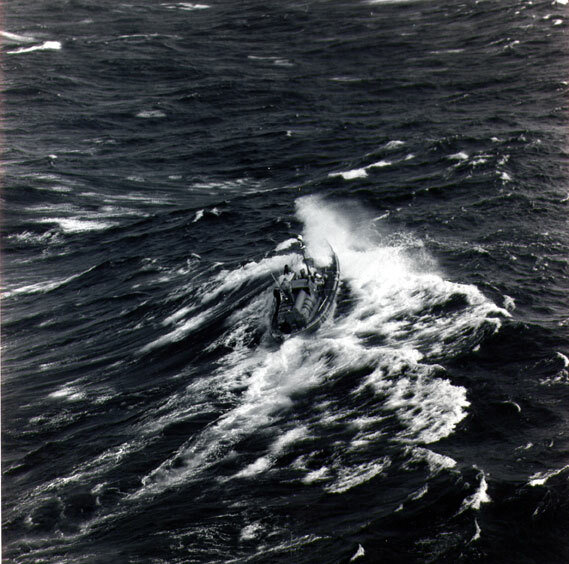 Of course there have been other gales and the occasional storm, like the 55 knots we saw one long evening on our way to the Austral Islands, but these all took place in deep water, unaffected by wave steepening counter current. Not much exposure in the context of 250,000+ miles at sea. Yet we know for sure that in spite of all our efforts to the contrary, one of these days we will get caught again. Hence, the emphasis on understanding the mechanics of what creates problems in heavy weather and how to mitigate them. Waterplane stability derives from the distribution of area at the waterline. The beamier the boat, the higher the initial stability. 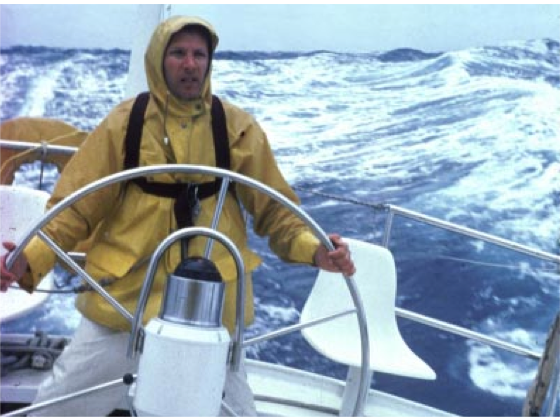 High initial stability can be good for sailboats as it allows more sail area, but can be a negative for motor vessels because of quick, uncomfortable motion associated therewith. High initial stability almost always implies low ultimate stability (capsize resistance). Vertical center of gravity is next. The lower the VCG the higher the stability. For sailing designs there is almost never too low a VCG. More stability is always faster, hence the pressure on increasing keel draft, and keeping weight low in the boat. For power vessels, pleasure and commercial, the combination of high initial stability and a low VCG is uncomfortable, and can be dangerous, to the point where freighters will shed deck load if stability is too high with the accompanying snap motion. The next factor is the buoyancy and added stability provided by the hull and any structure mounted on the deck as the boat heels. Every vessel has a stability curve, the shape of which determines how it reacts to waves, how far you can heel before losing the ability to come back, and the restoring force required to get the boat upright again if capsized. VCG plays an increasingly important part in recovery as heel increases. It is quite possible to have a design which will float on its side, not capsize, and not recover from a heel past the point of positive stability. Refer to the lead photo of the Japanese car carrier in the Gulf of Alaska for a good example of this. In order to have heeled buoyancy work for you the windows, doors, and vents need to stay water tight. Once there is a major inrush of water, perhaps just an off center vent, the situation quickly becomes grave. Free surface effect of liquids in fuel and water tanks can be a major contributor to capsize, if the tanks are not well baffled, or filled. Water trapped on deck by bulworks is another major risk factor. 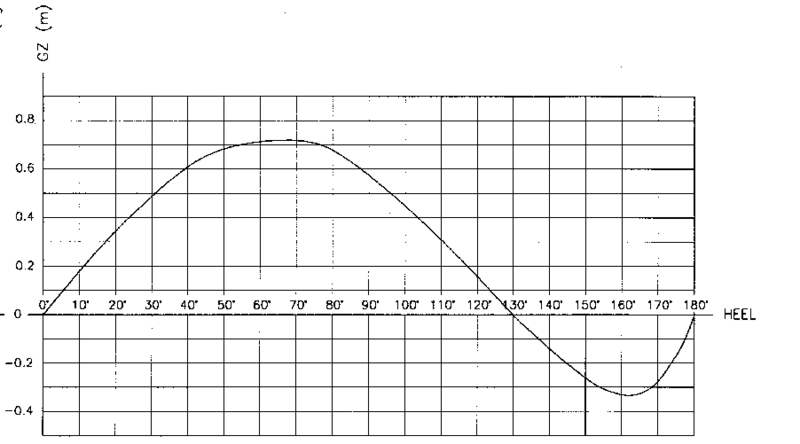 How does a designer or builder know what the heeled stability curve really looks like? In the olden days this was a long, tedious, and costly process. Today it is quick and cost effective. There are numerous computer programs that will roll a 3D model through specified heel angles, calculating the new waterplane and stability at each point. The other part of this is the VCG and that is a spreadsheet exercise, albeit in some detail, to determine where the weights which make up the boat are located. For sailboat designers, builders, and buyers, analyzing stability is at the top of the list. Almost all sailboat design and sea trial articles will publish a stability curve. There seems to be less concern from the power boat end of the spectrum, which may be acceptable in protected waters, with shelter close at hand. Offshore, with wind and wave risks factored in, one could argue for a more proactive approach to stability analysis. Initial stability is moderate and rises gradually with heel. Stability peaks at 60/65 degrees, and then gently falls. Ultimate stability is lost at 130 degrees. There is some inverted stability and wave energy will be required to right the capsized vessel (but not a lot). The graphic above is from a research project done to investigate commercial trawler safety as a result of numerous capsize incidents and the associated loss of life. The type one design(blue line) is a traditional moderate freeboard trawler while the type two (magenta line) is a high freeboard enclosed deck design. Note that both reach maximum stablity at around 25 degrees and then righting force drops precipitously. The traditional design loses positive stability at 50 degrees while the design with more superstructure will go to 85 degrees. However, neither design will right itself from a capsize. Next, we will investigate the FPB 64 stability curve. The curve which follows is from our preliminary studies. The final shape shall remain quietly secured – there is a limit to how much information we want to give away. But this is in the ballpark. Righting moment climbs in a straight line and peaks at 60 degrees. The righting force then remains almost the same until 90 degrees. This means the boat has maximum recovery force working at a point where normal yachts – power and sail – have long since lost most or all of their righting moment. Although the FPB 64 specifications call for 130 degrees this shows ultimate stability remains positive until 150 degrees. There is virtually no stability below the line indicating little wave energy is required to right the boat in a full capsize. Why don’t other ocean going motor yachts have this type of curve? There is a complex relationship between form stability from hull shape, VCG, the way weight is distributed (polar moments), where you live and work relative to the roll and pitch centers, and how this impacts comfort and cargo security. As we mentioned earlier, as you design in more beam – which equates to form stability – the roll period shortens. The shorter the roll period, the faster and less comfortable the motion. Passenger liners and many freighters have ballast tanks up high to reduce stability and lengthen the roll period. Of course their ultimate stability is compromised (we refer you to the lead photo in this regard), but for the ships, their odds of meeting a sea large enough to capsize them are reduced by their scale. Smaller yachts obviously do not have the scale effects working for them like the big ships and are more at risk.. When designing a beamy yacht, relative to a narrower configuration, for a given roll period (or comfort level), the VCG has to go up. Too low a VCG combined with extra beam means a short, uncomfortable roll period. Raising the VCG at small angles of heel has little impact, as hull form stability is dominant. But as the boat begins to heel, the VCG assumes greater importance, to the point where it is a major determinant of ultimate stability. Keeping tanks pressed (filled). For example, if you have four fuel tanks and carrying half your fuel capacity, it is better to put the fuel in two filled tanks than four half full tanks. Keep deck gear, dinghies, anchor rodes low. Avoid adding weight high (likes solid fly bridge tops, extra roller furling sails, and oversized rigging. We started using 3D CAD software back in the 1980s. The programs we ran then would take all night for one set of calculations. Today the calcs are much more sophisticated and happen in seconds. As a result, we can play “what if” games ad nauseum, working towards the optimal combination of characteristics. One of the areas we study are the shapes of the hull at various heel angles, and how we think the boat will react in a breaking sea. Lets look at some graphics showing floatation in different states for the FPB 64. Hatches and vents that are at risk from flooding. 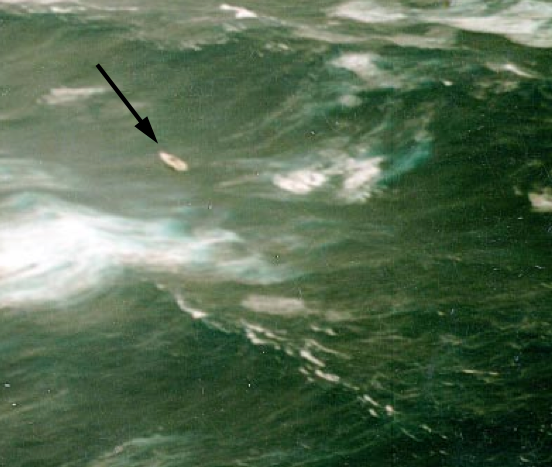 What the heeled shape looks like relative to how it will skid, or trip, when impacted by a breaking wave crest on the beam (skidding is a highly desirable reaction). Let’s start at 30 degrees of heel. The deck edge is clear of the water, and there are no air intakes, hatches, doors, or other items about which to worry. Still heeled 30 degrees (above), now looking underwater at the hull and fins. The bow is barely immersed relative to the stern’s floatation plane. There is little in this combination of hull and fins to resist skidding sideways with wave impact and with most of the resistance to skidding aft (skeg, rudder, and hull), the tendency will be for the boat to rotate on its axis bow down the wave. In our opinion the closer the bow is to heading up or down wave, and the further you are from having the waves abeam, the safer you will be. At 60 degrees the deck edge is immersed, but all openings are still well clear. 90 degrees and we are just now immersing the Dorade vents, which is why they have closure plates adjustable from inside the boat. The centerline air intake for the engine room is well clear. Here we are completely inverted. Note that the house and just a touch of deck are required for floatation, with the deck barely immersed This means the hydrostatic pressure on the entry door and deck hatches is low. The hatches on top of the house are less than five feet/1.5m below the waterline. Fully inverted like this the hull is highly unstable, meaning very little force is required to get the boat rolling right side up. And now an often overlooked issue, wave impact and how the energy is absorbed. If you have raced planing dinghies or catamarans you know that when the wind is puffy, and you are occasionally overpowered on a reach, pulling up the centerboard (leeward fin on a cat) allows the boat to skid sideways with the puffs, dissipating the wind energy. Modern, relatively light keelboats with high freeboard, will skid on their topsides when knocked down due to being overpowered, typically with a spinnaker flying. When a wave crest wallops your topsides it imparts energy to start the heeling process. If the boat is heavy, with a deep hull or keel, immersed surfaces and inertia of the mass, tends to hold the boat in place, allowing more energy from the wave to be transferred to the topsides. If the boat skids off to leeward with the wave impact, then the wave crest cannot impart the same force to the hull. The boat slips away from the wave, absorbing less energy over a longer period. Think of this like a boxer rolling away from a punch, taking the sting out of it as it were. 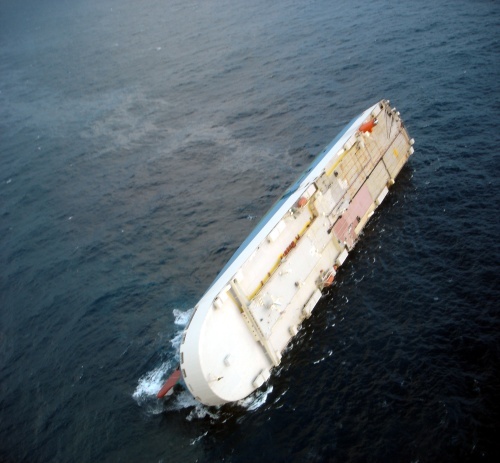 The ability to skid is a primary safety factor in dangerous seas. Heeled floatation planes which present surfaces that do not lock the hull into position. Light displacement relative to the topside area. Reduced vertical surface area below the waterline. Cruising grounds, season, normal and abnormal weather patterns. Conditions affecting sea state such as bottom topography, surface currents, and lee shore wave bounce. Possibility of secondary and tertiary wave trains interacting with primary wind driven seas. Length of passages (in time rather than distance). Secondary destination options if the situation deteriorates, or the primary goal becomes to risky. Primary and secondary destination approach considerations (lee shore, difficult navigation in adverse conditions, breaking bar). Possibility that it may be necessary to stand off in deep water until seas calm down and allow shelter. Vessel steering control up and down wind (can you run with the seas if required?). Range of heavy weather tactics available. Level of crew experience and skill. You and/or your crew’s need for emotional security versus living with nagging doubts. We are expert enough in weather forecasting to feel confident in our ability to avoid most severe weather. We cruise at 11 knots, so exposure is minimized. We can run with a storm and not worry about steering control and broaching. We understand heavy weather tactics. Yet we know that there is always a risk, especially on passages of more than two days, that the weather models, the professional forecasters, or we, will be in error. Maybe its a major malfunction that slows or stops our progress. Bottom line is neither of us likes worrying about what might happen if the voyage does not go as anticipated. We want to be emotionally secure, knowing if (or when) we are caught in truly dangerous conditions, our vessel is going to give us the best chance of success. How do you determine if your yacht, or one you are considering, has sufficient stability? First, decide what you want in this regard. Is a conventional stability curve for the class of yacht you are considering OK? Are you willing to go to sea on a vessel that will not recover from a capsize? If not, what is the minimum range of positive stability that is acceptable? If you are buying a yacht, ask to see the stability curves (something common with commercial vessels and yachts built to code, and most sailing designs). If these are not available, there are naval architects who will check the righting moment, and then using this plus a set of lines, calculate a stability curve. OK, enough of this. It is a lovely winter day in Tucson, Arizona, we are starting to think about some testing we need to do with Wind Horse, including a gale or two in the Gulf Stream. PS: If you want to learn more about storm tactics take a look at our Surviving the Storm. You can read excerpts and learn more about the book here. Click here to download a basic pdf file on stability. This entry was posted on Sunday, January 8th, 2012 at 12:10 am and is filed under Dashew Offshore, Design Objectives. Both comments and pings are currently closed. FYI there was no video as you mentioned at the beginning. At least not with my browser, firefox. Oops – Thanks David – Fixed now. Whose 3D CAD program do you use? We started with Fast Yacht, the first of the 3D hull design programs along with its VPP code, mid 1980s. Stayed with it, or more properly George Hazen and Bruce Hays, as various defense contractors bought and sold their company. This has evolved into ORCA 3D which runs as a plug in for Rhino 3D. A concise and easily understood initial discussion of the concepts. The physics are indeed essentially straight forward but the engineering of those forces to work in conjunction with the compromises necessary to design to a set of expectations is art – and you do it well. I would think any naval architecture curriculum would consider itself lucky to have a “visiting professor” with your experience to share. Thank you again for peeling back the onion! At its heart, this stability business is really very simple. The trade offs, on the hand, are a little more difficult to conjur. This article took some time to work up, but so many folks are crossing oceans and taking risks of which they are unaware, that we thought we owed them the effort. This is excellent. I can not honestly say I understand everything but I know enough to know that you know what you are talking about and I really appreciate you putting it all together for us to absorb and grasp over time. I have decided on a Garcia Passoa 47. This is a strong well designed and built alloy boat that comes as close to your philosophy as I can afford at the moment. I wish it had a pointier nose and less beam but that is the breaks. Congratulations on the purchase! The main thing is to go cruising before it is too late and waiting around trying to earn additional funds for a more costly vessel, versus going now, never makes sense. Everyone would benefit, the insurance folks, the Coast Guard, the boat owners and the ocean. John, your comments about power boats couldn’t be more off base. Steve, great article. I assume power or sail boats will react similar with regards to the stability calculations? The basic stability calcs work the same for sail and power. There is may be a difference in how sail and power react based on their immersed hull shapes and if they skid off with the wave impact or sit there and absorb all the energy. Sailboats also have a rig which contributes to polar moments, more of which are better than less when it comes to absorbing roll energy. Hi Steve, Just an observation. The “trawler” you refer to in the video isn’t a trawler but a purse Seiner. They are running with the power skiff, (about 10,000lb.) on deck which is a complete no-no in rough weather. These boats should never run in that configuration in anything but relatively calm weather. The weight up high was a likely cause of the trouble. VCG is a huge contributor to problems. We also don’t know if she had any free water affects from liquids sloshing in her tanks. The key point in the video, however, is the breaking crest that seemingly comes from “nowhere”. For those folks who think they can ride out all situations heading into the waves, this should be a wake up call. There are more of these sneaker waves than one would think and you need to be able to deal with them as well as those on the bow. Thanks for this new details concerning your 64’. We are curious of the roll period of your 64’ and did you make some seas trials without Naïads ? Motion is a function of many things and a complex subject. The shape of the stability curve, the polar moments of the vessel’s mass, the period of the waves and how it reacts with the boat’s natural period and how the hull feels the seas are the basics. If the wave period is the same or a harmonic of the vessel’s, then it can get uncomfortable in a hurry. Both the FPB 83 and FPB 64 have natural roll periods of about four seconds due to their relatively high polar moments. As to comfort without the NAIAD stabilizers, the boats will roll a bit, but between the slow roll period and the location of the living space so close to the roll center, the motion is surprisingly pleasant. If we were starting a long passage and lost the stabilizer system, we’d not hesitate to continue. I have a 44 ft. coastal cruiser. This has made me a lot more conservative regarding weather and waves. I have some river experience and have always had a lot of respect for inlets and bar crossings but I was one of the people that did not understand the size and frequency of the “sneakers”. The volume of calculations must have been daunting in the slide rule days. No wonder experience has always been so highly regarded in the nautical world. Where did you learn naval architecture? We’ve learned NA the hard way, by doing… for a long time. The process is technically simple. The hard part is understanding what works and what doesn’t in the real world. To those aspiring to design we’d advise first to get some offshore passages under their belt, then to live with a yacht or two over time, and then to periodically head offshore. Excellent summary of the factors involved in real world stability. Here is an anecdote for those who place their trust in USCG regulations and definitions of stability. One of my employees had a night job building seats for a whale watching motor vessel intended to operate in Hawaii. The vessel had passed its USCG stability test, was fully certified to carry passengers and was awaiting shipment by barge to Maui. My guy installed his seats on the upper deck and submitted his bill. A couple of days later he was told that the boat had upset while sitting at its dock in Lake Union, and the builder tried to sue him for causing the accident. Of course what had happened was that fall leaves had plugged up the inadequate drains, the upper deck filled with rain water, a passing wake started the free surface effect, and over she went. Something to keep in mind next time you are tempted to set foot on such a contraption! There is more to stability than can be demonstrated by putting lead weight the side deck and measuring the first few degrees of heel while sitting at the dock like the “engineers” at the USCG demand! It is excellent to read the thoughtful cares that go into the design of an FPB. Compared that to the 60 meters French luxo motor yacht (designed and built in 2010) that just capsized and sunk today in the Aegean sea after some mechanical failure in a not very stormy sea. Do you have any more data or links so we can check this out? There might be something to learn from here. First of all thank you for contributing to my ongoing education, how much impact would going to a lighter stronger metal, like grade 5 titanium make in lowering your VCG, if you used it when possible in your designs. There are many less costly methods of lowering the VCG, if required. However, we are fine with it now using conventional materials. And, you need the polar moments of some of these heavier high items to slow down the roll period. Nice article. The classical GZ curve obtained from a simple STATIC analysis, gives the maximum angle that a vessel can recover from providing there is NO EXTERNAL HEELING moment; thus if we look at Fig 14 the type 1 boat can recover from an angle of heel up to 90 degrees, while the type 11 boat can only recover from a heel angle of about 50 degrees and the Halberg Rassie 40 can recover from an angle of heel of 130 degrees. However, if there is an external heeling moment, as there is due to the wind in a sail boat, then a DYNAMIC analysis will show that stability is governed by the slope of the GZ curve. 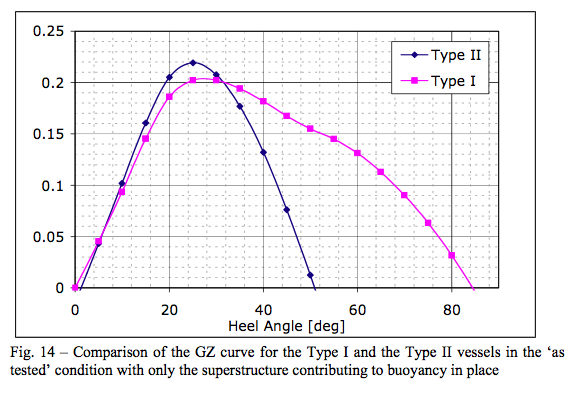 As one can see the slope of the curve is zero when the GZ curve is maximum, after this point the resistance starts to fall off and if the EXTERNAL HEELING MOMENT IS SUSTAINED the angle of heel will continue to increase until the masts are in the water! The vessel is unstable whenever the working angle of heel is such that the slope is zero or negative. 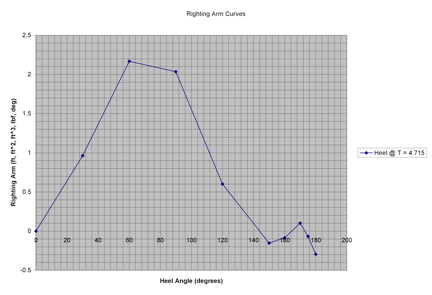 Thus looking at the curves, the maximum working heel angle is for type 1 and type 11 is much less than 24 degrees and for the Halberg Rassie less than 65 degrees. Now, of course, this instability is dependent upon the external heeling moment being sustained and in reality once the angle of heel changes the load can be taken out of the sails and the vessel will then fall back to a more stable heel angle. But Murphy’s law will ensure that the main sheets will get stuck and the load will increase! My conclusion is that as well as the GZ curve its SLOPE will give a better indication of stability under sail . I think this is important because my feeling is that the so called angle of vanishing stability- when the GZ curve has a value of zero-is misleading and can give an false impression of security, when in fact, dynamic stability occurs at a value MUCH LESS than half of this angle. While a full dynamic analysis involves inertia forces and moments, the important information is obtained from the slope of the GZ curve and this is readily obtained. I have been reading your blogs for years and have been debating the traditional trawler versus more contemporary designs. I am curious to know whether you find any of the study’s numbers present a glaringly obvious problem, or whether their recommendations of having someone onsite to evaluate during launch was sufficient given the numbers stated. It is moments like this when people like me appreciate people like you being involved in the marketplace. When everything goes right, we can forget to ask the right questions. Hey Steve, thanks for the work on cruising safety that you have been doing. I have really enjoyed reading the two books you recently released on Weather and storm survival. I could not get the PDF on stability to load, any suggestions? Hello – I have for my 1980s designed boat boat a paper lines plan with a table of offsets. Seems most current hydrostatic programs I see want you to “design” the boat within the program. Can you recommend a program that will instead allow a user to simply input lines plan dimensions without building the hull model? Not sure these days Jim, but there used to be several programs that allowed digitizing the lines. Perhaps one of the SetSailors will have a recommendation.